Saturday 17th August – no adult or kids classes because instructors will be attending the Will Reed seminar. Thursday 15th August – no adult classes because instructors will be attending the Will Reed seminar. Here are a few interesting excerpts in relation to ‘irimi’ by Wendy Palmer in her book “The Intuitive Body: Aikido as a Clairsentient Practice”. It includes a telling quote from the late Terry Dobson. “Irimi is the act of entering into life – not trying to avoid it. Irimi is a way of consciously exploring our fear that provides an opportunity to understand what holds us back and prevents us from living fully. What are some of the elements that help us to face our fear, to open our hearts, and move forward into life? When you learn Aikido, you realise that like most other traditional martial arts, practice begins and ends with courtesy. Etiquette is a standardised set of behaviours that ensures that everyone acts in a uniform and predictable manner whilst in the dojo. So why is it necessary? Firstly, it is the way that an otherwise diverse group of active individuals can remain safe during practice. Secondly, it teaches us to pay care, attention and respect to our training partners which, during the course of a class, includes all other students in the dojo. 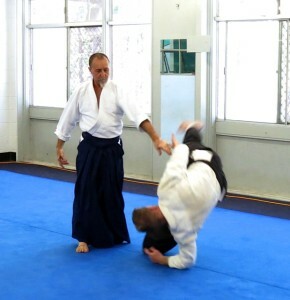 Aikido is potentially a dangerous activity and requires great concentration. If there is no code of standardised behaviour, how else can 15 -20 people on a mat practice under movement at close quarters without accident or injury? Bowing a Bokken or Jo onto the mat serves to makes us very aware that we have a dangerous weapon in our hands. Even an accidental bump with a wooden weapon can cause painful injury. A tap on the head can cause damage. When we bow onto the mat, we are paying respect to Kamiza. This is the place of honour at the front of the mat which symbolises the presence of the founder and the heritage of the art. Bowing on to the mat also serves as an individual reminder to focus on what we are about to do and to do it with a calm, clear mind and no distraction. When we step onto the mat to practice, we are entering a potentially dangerous place where a high level of concentration and awareness must be maintained. It pays to be respectful when you are about to practice an art that is not a sport; and, in that context, has no rules and no competitions. We also bow to our training partner not only as a matter of courtesy, but also to signify that we are both ready in mind and body to commence practice. Safe practice and the best opportunity to learn occur when both partners are aware and present in the moment. An attack and response with one partner distracted is an accident waiting to happen. In terms of respect, bowing means that we are acknowledging our training partner with courtesy, and paying close attention to their needs. It is important to be sensitive to the needs of our training partners because two people are rarely at the same level of ability at the same time, in all aspects of the art. The need to be sensitive to our training partners is extended further because it has been long established that the most effective way to learn Aikido is through ‘cooperative’ practice. It is an opportunity for two people tuned in to each other (harmonising energy) to learn by applying and receiving techniques in turn. One leads, the other follows; both learn. It is a waste of that learning opportunity to introduce unwanted resistance. To deliberately impede cooperative practice by repeatedly blocking or offering resistance is nothing more than ego at work, not to mention … very disrespectful to a partner who is kind enough to contribute their mind and body to the other’s learning. 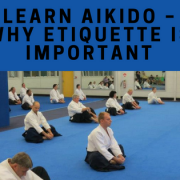 Etiquette is very important when you learn Aikido. Bowing is the outward form of respect; and over time, it is hoped that the inner form follows to the point where genuine care and respect for other people becomes second nature. The more we discover genuine care and respect for others, both in word and deed, the safer we will all be – in or out of the dojo. 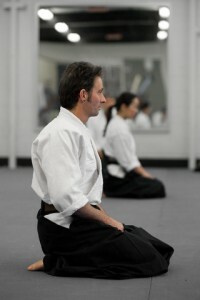 Learn Aikido at Griffith Aikido. Start this week! Congratulations to Tien Tien and Ting Ting who performed a very good 2nd Kyu grading demonstration last Saturday. Both were relaxed and very much in the moment as they worked through the curriculum techniques and then into their taninzugake which was also free flowing. And to finish, they found good voice as they powered through their Bokken and Jo kata. Well done to two committed and hard-working sister. Congratulations also to Michael who performed his long awaited 4th Kyu grading. Michael kindly contributed to our benefits of Aikido matchbox feedback above. He has been training regularly since he restarted his Aikido training and his commitment to the art is paying dividends. Very well done Michael, your techniques were very well executed and you are a great example to those coming up behind you. Also a big shout out to Jane who also graded to 7th Kyu during the week. I wasn’t there but Ben Sensei was impressed and that is high praise. You are on your way! We look forward to many more Tuesdays and Saturdays classes with you. If you would like to enjoy the benefits of Aikido contact us. NATHAN location and class times / EVERTON HILLS location and class times. 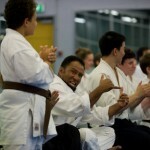 After an extended break, we are recommencing Aikikids class at Nathan next Saturday 27th July. The class starts at 10.30am and runs concurrently with the adult class on a separate mat, finishing at 12.30pm. If you are looking for local Brisbane kids activities, then this may be for you. The Aikikids program has improved in many aspects. It will be run as one class for all children between ages 7-13 years. Younger children may be accepted according to individual circumstances. Although we are not taking away the fun, the class will focus a lot more on Aikido, its principles and techniques, and less on playing games. Interested parents should bring their child along to any Saturday morning class. We do like to meet with both parent and child prior to commencing training. Fees are $25 per child per month payable in advance via our website. We have done away with the 12-class pass although we will honour cards already purchased. We ask parents to stay inside the dojo and remain in sight of their children for the entire duration of the class. Parents are responsible for the needs of their children off the mat, including taking their own child to the toilet. We teach children the principles and martial techniques of Aikido inside a gentle and cooperative framework. One of our aims in the Aikikids program is to build confidence and focus at an early stage, which is why we structure a lot of activities around calm and self-control. All of our instructors are black belt qualified, certified in basic first aid and carry volunteer blue cards. 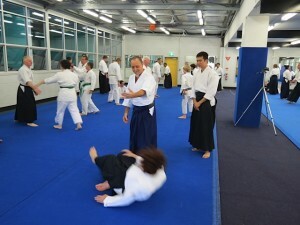 Aikido Brisbane fun and fitnessIt is really heartening to see class numbers rising at Griffith Aikido Brisbane. The number of people training at Nathan dojo is steadily rising and dojo is getting back to its old vibrant self. It’s also good to see a few more people training regularly at Everton Hills. It was gratifying to see such a good turnout for Michael Karkkainen’s Sensei’s class on Monday 8th July. Michael Sensei will return to Everton Hills tomorrow night Monday 22nd July. 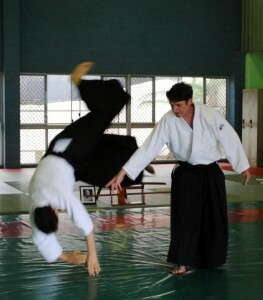 brisbane martial arts, safety Griffith Aikido will be participating at the student Market Day on Thursday 25th July. A very big thank you to John Murray who is planning a stand with a much higher profile than we have enjoyed in the past. He is purchasing a couple of retractable vertical banners made for the occasion. John is also taking leave from his job for the day to attend our market stand. Thank you very much John! 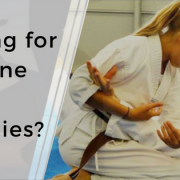 If anyone else in the club has a little time to keep John company for a while talk to curious students about the incredible benefits of Aikido, please contact John on 0407 253 911. Words have a power of their own. The power of the spoken word was recognised in ancient Japan as ‘kotodama’, or word spirit. To speak a word is to encourage it to come true. Your life energy responds to sounds and thoughts, as expressed in the spoken word. When you fill your daily life with positive words and thoughts, your life is filled with the power of Ki. In this way you can keep mentally and physically healthy, and have a positive influence on others as well. Words have real power, and can produce practical results in your life. Holding negative thoughts in my mind works against my best interests. Therefore, even if my body suffers physically, my mind remains optimistic. Even if I encounter obstacles, I am never defeated. Daily I fill my heart with thoughts of joy, gratitude and hope. I face each new day with a bright and optimistic spirit, which I express in word and deed. I have faith in life and life responds in kind. When looking for martial arts Brisbane and you are not into kicking and punching consider a highly refined art that has a significant internal aspect. I am referring to the concept of Ki. It is integral to the relaxed power that drives the art of Aikido. Training with correct internal principles is just as important as training in the outer forms of technique. It is easier to coordinate mind and body when we are sitting or standing still than when in motion. But true unification means to maintain the coordination of mind and body even when we are moving. The Ki development exercises train one to always maintain the unification of mind and body in our daily life. By applying them to our life, we can perform to the best of our ability in all circumstances. 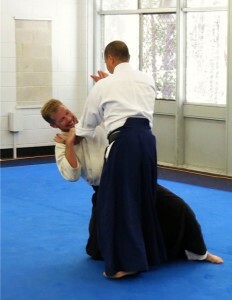 The purpose of Ki-Aikido is not self defence; that is a mere by-product. It is far more important to learn to control the mind and body. It is too late to try to calm the mind after you take up the sword. First you must calm the mind and then extend the sword. When you raise the sword overhead, do not cut your Ki. Continue to calm the mind by half, half, half … and create a living calmness in that infinite reduction. When practicing cutting with the sword you will find infinitely more value in cutting just five to ten times with Ki fully extended, then you would in cutting a thousand times with mere physical strength. 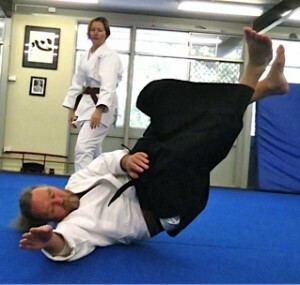 For something different in martial arts Brisbane, try Aikido Yuishinkai at Griffith Aikido. Michael Karkkainen Sensei will be teaching at Griffith Aikido Brisbane Everton Hills dojo on Monday nights 8th July and 22nd July. Michael is a 5th Dan instructor and usually teaches at Nathan on alternate Tuesday nights. Everton Hills members should not miss this wonderful opportunity. Strongly recommended. Everyone is welcome. 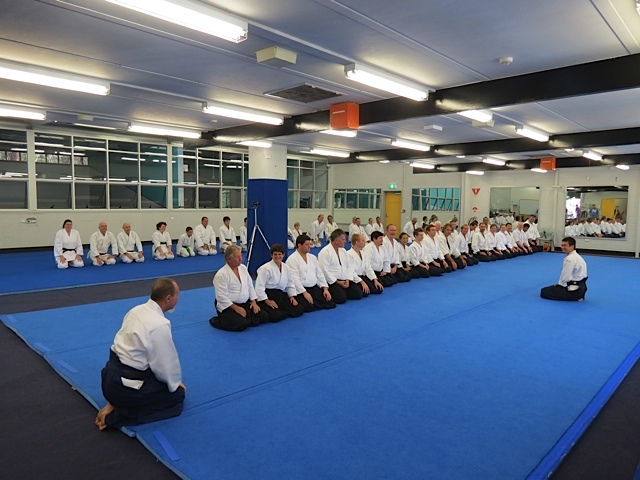 I am pleased to tell you that Griffith Aikido Brisbane is prospering! It is no secret that the club has been through some challenging times over the past couple of years. Ups and downs are a fact of life in every organisation, but if experience has taught me anything, it’s that adversity and change usually bring with it opportunity; but only for those who choose to see it and act on it. We are very aware and proud of our history and lineage as we plan for the future. The past is our history and our heritage; but ultimately it is a collection of memories and a rich source of stories. Life is in the present and that is where we are focusing our attention. Aikido teaches us to connect; to be aware of everything around us and to be present in the moment. One of the benefits of heightened awareness training is that it allows us to anticipate change. Change is inevitable. Often, it is the only certainty we have. The positive to be taken from it is that the more we meet change and blend with it, the easier it becomes to embrace it and work with it. One of the social benefits of a dojo is meeting new people and the new experiences that result. But it is a fact of life that people come and go. Although the going part is rarely what we want, we must enjoy their company and learn from them for the time they stay. In the end, we are all on our individual journeys; and every now and then a crossroads is reached; a decision point where we must ultimately take different paths. There is never a need to despair over fluctuating dojo numbers. The important thing is that those who want to be at Griffith Aikido are here and very happy to be here. They are our loyal members who want to give back to their dojo, and share their knowledge with students coming up behind them. For that reason, dojo longevity is never at risk either. Numerically, it is simply a function of people starting versus people leaving. At times, more people leave than start. We have been through one of those times. This should never be regarded as a poor reflection on our dojo or our people. Aikido for the most part is a leisure activity, and people leave because life overtakes them at one time or another. Work, family, relationships and other interests are the most common reason. These things are not in our control. By contrast though, a lack of people starting is very much within our control. It means that not enough attention has been paid to engaging the community and broadcasting our message. People walking through our dojo door to learn Aikido is a blessing, but not one that we should ever take for granted. Like every other organisation offering a service, volunteer or not, we must give the process of attracting new members a high priority. ‘Build it and they will come’ only happens in the field of dreams. With all of that in mind, we have been busy doing a lot of planning since the AGM, and now it is paying off as we regain our momentum. This driving force is in no small way due to the efforts of our dedicated volunteers on the management committee and several other willing members. I look around at our considerable club resources and feel blessed. We are spoilt for choice with an amazing group of instructors. Some of the most senior Aikidoka in Brisbane teach at Griffith Aikido Brisbane. We have some of the best facilities in Brisbane with two first class training venues and Everton Hills and Nathan; and we have an abundance of mat space and equipment. Above all, we have peace and harmony; and it’s hard to place a value on that. All that remains is to increase our student membership. We are doing that one student at a time, by actively engaging with the community. Aikido continues to be a word worth spreading, because it represents the one thing that most of us want. That is peace and harmony in our lives, mostly within ourselves. The Art of Peace helps so many people in all walks of life. To grow a thriving dojo we need effective media. We are now back on air with a new professionally built website that is once again capable of being ranked and able to attract new students. We will apply our resources to support our site with a program of ongoing internet marketing and local promotional activities as we build into the future. We will stay true to our charter which is to promote Aikido to the wider community. Accordingly, we are positioning Griffith Aikido as the premier Aikido institute whose core objective is to develop people of all ages and abilities from beginner to black belt. One of the key elements we have lacked for some time now is a quality senior’s program. As I said above, we are blessed to have some very senior and talented instructors available to us and who are willing to teach regularly. They include Steve Dows Sensei, Thom Hansen Sensei, Michael Karkkainen Sensei, Rod Nixon-Smith Sensei, and Ben Tan Sensei. In the near future we will roll out a comprehensive seniors program. More details soon. Narelle, Chris and I are putting together an Aikikids program for Nathan dojo which will be very different to that of the past. We are following the model successfully implemented at Everton Hills where emphasis is on self-discipline and learning basic Aikido skills instead of playing games. We aim to instil the basics into children at a much earlier age. 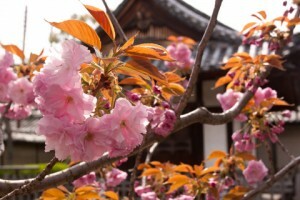 As part of the program we will teach techniques to children using the Japanese nomenclature. Aikikids classes will reopen at Nathan dojo on Saturday mornings soon and will run on a separate mat concurrently with the adult class. Our aim is to close the competence gap for young people transitioning from Aikikids to adult classes. This will also provide the opportunity for parents to join the adult class and know their children are in sight and are well taken care of. We will start as soon as there is parent interest. To register your interest, please call Narelle on 0413 664 611. We have found our mojo and rapidly regaining our old vibe. We invite former students to consider re-engaging with Griffith Aikido. 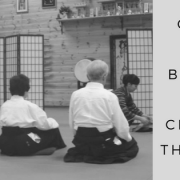 We know life overtakes everyone at one time or another but you were all part of the interaction that characterised a good night on the mat at Griffith Aikido. If you are willing to embrace all aspects of Aikido Yuishinkai and our club policies, you are most welcome to re-join us. Finally, I would like to give a big shout out to Steve Dows Sensei. His family has been in crisis for a while now and, as part of his Aikido family, we offer our best wishes and solid support. We send Steve and Lynda our best wishes and collective good Ki. I guess it had to happen sometime. 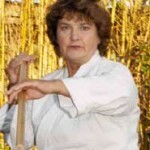 Sadly, and after all these years, Jutta Dowdy has stepped down from active involvement with Griffith Aikido. Without Jutta around, things will never be quite the same. Jutta has been the Matriarch of our club since well before I started learning Aikido. For decades, she has been there for all who have passed through the club; the rock of Griffith Aikido through good times and bad. We have all taken her luminous presence for granted. Why wouldn’t we? Jutta has been woven into the fabric of Griffith Aikido. The two names have been synonymous for such a long time, and will be so for a long time to come. I count Jutta as a personal friend, now and always. We have exchanged orchids and Stollen; that makes it official. I recall many training nights that we car-pooled to Nathan; and the many happy conversations together as we drove along Ipswich Road. I am pleased to be the President of Griffith Aikido Brisbane, a peaceful organisation practising the Art of Peace. Aikido has become an incredibly important part of my life and I willingly give back to the art I love, so that others may have the opportunity to enjoy the same benefits. Accordingly, I encourage everyone at Griffith Aikido to strive for self-improvement. It doesn’t happen overnight or on every day, but if you walk the path long enough, the journey is worth it. As I said at the AGM, Griffith Aikido will focus entirely on the Art of Aikido, with none of the distractions of the last twelve months. We as a club, will regain our centre, and aim to quickly regain our status as a premier teaching school. We have fantastic instructors and a wealth of talent and experience; and now we have added the final ingredient – strong and positive leadership. I am very pleased to announce that Steve Dows Sensei has been formally appointed as Griffith Aikido’s Head Instructor and will oversee Aikido at both Nathan and Everton Hills dojo. 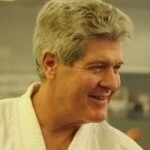 Steve will work with dojo heads, Rod Sensei and Ben Sensei on a wide range of syllabus and teaching programs. We are fortunate to have two different post seminar reports written by two of Griffith Aikido’s yudansha members. 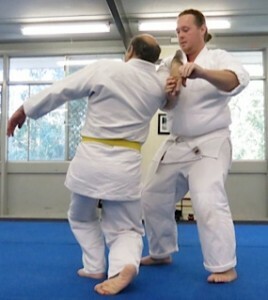 Michael Nash (shodan – Nathan dojo) and Craig Boyd (nidan – Everton Hills dojo). We will start with Michael’s account. Those of us that have trained with Chicko Sensei before were eager to see if others would be as impressed with Chicko Sensei’s approach to Aikido as we have been. He is welcoming, unassuming and extremely generous in sharing his take on what he terms “Aiki Principles”. He had a record number of participants up as his uke at some point, but if you missed him personally you could also grab any one of his students that graciously made the journey to GAI as well. I know many of our Yuishinkai members got a bit of a shock when they were lined up against a Fudoshin “white” belt. The morning session started with just under fifty people, and we got a few more for the afternoon session so we were just about capacity. People came from Byron Bay, Bald Hills, Bayside, Noosa and even interstate and the atmosphere was very positive from the start to finish. 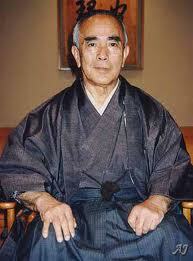 The theme was to explore O’Sensei’s “expression” of Aiki in his latter years. I would encourage you to get hold of any old footage of O’Sensei and reflect on Saturday’s sessions, you will see many similarities. We had two of the three Australian Yuishinkai Nanadan’s in the room as well as many other highly ranked participants which also added to the excitement. Chicko Sensei started and finished on a similar note, emphasizing the feeling of gathering and welcoming in Uke when he attacks with your breath and your whole being, joining uke as one, and then redirecting the power to a peaceful conclusion. Always natural, always calm, Sensei embodies these attributes, it looks so simple but attempts by many of us fall so short as we are yet at that part of the mountain. As usual Gavin, Shane and other Fudoshin members took the brunt of Sensei’s demonstrations, their Ukemi is a tribute to the school as Sensei had little hesitation wielding Bokken, Jo or many other forms of Atemi tantalizingly close to these Uke’s vital organs or face. They tend to give more contact and for a longer time than we are typically used to but if you were watching closely that is because any slackening of intent provides opportunity for nage to initiate the ultimate end. The sessions revolved around concepts rather than specific techniques, emphasis on small specific natural movements to get nage into a position where many technique’s can / could then evolve. For me this is the next level, a freedom of expression that is not bound by the rigors of specific waza. Similar philosophies are expressed by our own Maruyama Sensei for higher grades. Uke is already defeated as soon as he attacks, if you can get the universal concepts ingrained into your mind and body, and then unify them. It is always assumed with Chicko Sensei you have a basic understanding of technique and he does not care much what variety that may be, it is the “expression” of the waza, as he puts it that matters. Also for me another aspect of a session with Chicko Sensei that brings a smile is his insistence he cannot really teach us anything, more so it is for us to discover. He does, however, help point you in the right direction. It was interesting to watch the expressions on faces of our members on the mat with Sensei holding their centre from first contact, to them writhing on the mat attempting to get up with Sensei calmly holding their hand or finger. I know no one left the dojo in any doubt that Aikido is truly a journey of a lifetime and we were guided by Sensei on his view of Aiki and the expressions of these principles. I also know most would have left thinking “what just happened”. From experience it takes a few days for the information to settle in but I can assure you what did happen, was we were treated to an insight on Aikido that few have the privilege to take part in. So reflect on it, try to utilize it in your daily life and your own Aikido and also look forward to the next time we can get Chicko Sensei down to Griffith Aikido for another seminar. Another perspective of the seminar, this time from Sensei Craig Boyd. 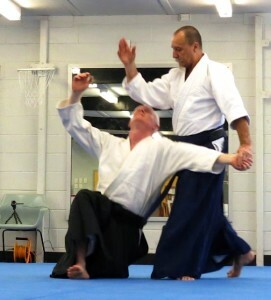 Griffith Aikido were fortunate in Hosting Sensei Chicko Xerri – and what an amazing day everyone had exploring concepts of Aiki that in Yuishinkai are probably not explored as deeply or to such effect as what we all saw at the seminar. Sensei explained that he looks at the expression of the final development of O Sensei’s journey. This is where the meeting (the “Ai” in Aiki) is about “breathing them in and welcoming them into you universe” through the use of Kokyu (breath and timing) the other aspect was don’t collide, so there was always a movement or change in position that accompanied the breath. This takes the Uke’s centre, or mind if done correctly, which then makes technique much easier. Sensei repeatedly demonstrated this throughout the day emphasising – small movement off line, absorbing the energy, stand your ground , and technique will just “happen” …..that simple!……..well I wish it was, as it certainly looked easy but to put these simple concepts into practice was another thing. Sensei would demonstrate a slightly different new position/movement from a different attack , from there he would explore and demonstrate technique options that can be done from the new position, after this he would send us on our ways to pair up and explore the core concept. So this was how we spent most of the day; observing and then going and trying for ourselves to discover more of the great Aiki mysteries. (there were a couple of video camera’s about so hopefully we will all be able to revisit all the small details that were demonstrated). A very nice parallel was how sensei explained Ukemi , how to take it, and its importance on learning to protect yourself. 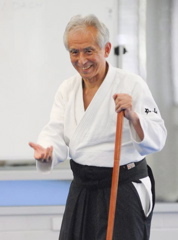 This was also addressed by Maruyama Sensei at the last Byron seminar – but Chicko sensei reiterated the importance for uke to protect themselves, be aware of what nage was doing and why when we roll or fall down it is a good thing! This was aptly demonstrated with a few examples of “potential broken noses” and also very nicely explained/demonstrated using a bokken and the potential to be cut, with Uke protecting themselves from these different threats. He also mentioned that training is as much to train Uke awareness and sensitivity in potentially dangerous situations again also spoken about by Maruyama Sensei. 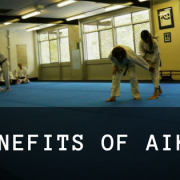 Ultimately it was great just for everyone to have a look at what is possible in their Aiki journey, where technique is forgotten in place of just great positioning. I’ve heard that “Aikido technique is not Aikido. It just teaches you Aikido”, but I’ve always had a hard time with this as the question lingers of “if I remove technique, what does Aikido look like?” After Seeing Chicko Sensei perform Aikido I now have a glimpse and a better understanding of this. It would be safe to assume that every one saw something unique and brilliant so hopefully it was a worthwhile experience where some new ideas were seen and some old ones confirmed. Finally a big thank you to the organisers, Sensei Chicko & his Deshi, the Yuishinkai Aikidoka, and all our other visitors for putting aside styles, making the trip and just getting together to explore Aiki!